For Doug Herrick, his experience in the United States Navy was excellent preparation for business ownership. After earning his wings as a naval aviator, Herrick spent nine years active duty, retiring with the rank of Lieutenant Commander. 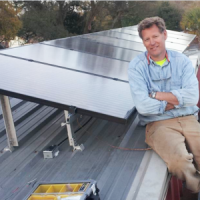 Leveraging his military experience and background in sustainable construction, Herrick founded Pensacola-based SunFarm Energy with colleague Donald Long in 2011. SunFarm Energy is a solar integrator company in Pensacola that designs and installs solar photovoltaic systems (PV) for commercial and residential use. Using solar panels, PV systems unlock the sun’s vast energy by converting it through a series of steps to electricity. The company provides benefits for consumers, helping them save money and conserve energy. The end results are very good for the environment as well. Herrick has worked collaboratively with the Florida SBDC at UWF, specifically with Business Consultant Dan Cavanaugh since 2011. In May 2014, Regional Director Kelly Massey chose SunFarm Energy, along with other businesses, to be part of his summer 2014 class pilot project, “Small Business Consulting.” Massey’s course asked UWF College of Business students to perform hands-on marketing research and development plans for clients. The students assigned to SunFarm presented immediate and long-range marketing goals for the company. They shared findings on how Herrick could enhance his branding style, increase social media presence, develop his relationship marketing and create a long-term budget. Herrick was very pleased with the student report and his overall experience with the FSBDC. "I highly recommend small business owners go to the local FSBDC to see what assets and wealth of knowledge they can offer you."